Influenza A, B and C viruses are negative-strand RNA viruses that replicates in the nucleus of infected cells and which share a common genetic ancestry. While influenza A virus has been more deadly, the severity of influenza B virus cannot be underestimated. The genome of influenza B virus contains eight negative-sense RNA segments (vRNA) covered by the viral nucleoprotein (NP), the major component of the ribonucleoprotein complex (RNP). NP contains a nuclear localization signal which provides the transport of the RNP to the nucleus via importin. Each RNP is composed of vRNA bound to the RNA-dependent RNA-polymerase which consists of three subunits, PA, PB1 and PB2. Viral RNPs act as independent molecular machines for transcription and replication in the nucleus, both processes being mediated by the heterotrimeric RNA polymerase complex within the context of the RNP. NP is a key adaptator in this complex, regulating the balance between transcription and replication during the virus cycle. Nevertheless, the switching step from replication to transcription is still unknown. The team that works on the influenza virus polymerase consists of a CNRS scientist, Thibaut Crépin, two PhD students, Alice Tissot and Christopher Swale, one technician, Laura Tengo and the group leader, Rob Ruigrok (Rob.Ruigrok@ibs.fr) and the electron microscopy team is led by Guy Schoehn (guy.schoehn@ibs.fr). The teams work in very close collaboration with the group of Stephen Cusack at the EMBL Grenoble Outstation (cusack@embl.fr). One PhD supported by this grant at the UVHCI since October 2013 : Alice TISSOT. Ruigrok, R.W.H., Crépin, T., Hart, D.J. and Cusack, S. (2010). Towards an atomic resolution understanding of the influenza virus replication machinery. Current Opinion in Structural Biology 20, 104–113. Monod, A., Swale, C., Tarus, B., Tissot, A., Delmas, B., Ruigrok, R.W.H., Crépin, T. and Anny Slama-Schwok, A. (2015). Learning from structure-based drug design and new antivirals targeting the ribonucleoprotein complex for the treatment of influenza. Expert Opin Drug Discov. 10, 345-371. doi: 10.1517/17460441.2015.1019859 (Review). Swale, C. Monod, A., Tengo, L., Labaronne, A., Garzoni, F., Bourhis, J.M., Cusack, S., Schoehn, G., Berger, I., Ruigrok, R.W.H. and Crépin T. (2016). 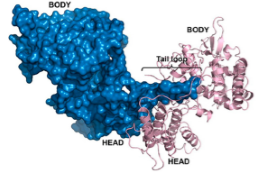 Structural characterization of recombinant IAV polymerase reveals a stable complex between viral PA-PB1 heterodimer and host RanBP5. Sci Rep. 6, 24727. doi: 10.1038/srep24727. Labaronne, A., Swale, C., Monod, A., Schoehn, G., Crépin, T. and Ruigrok, R. W. H. (2016). Binding of RNA by the nucleoproteins of Influenza virus A and B. Viruses, 8, 247. doi:10.3390/v8090247.